marks the Frisian girl or woman. This is the story of why the helmet is worn. sacred to him. People would bring there sick to the tree and leave them there. tears, first of sorrow and then of joy, rolled down her lovely cheeks. It was so much finer, and oh! so different, from what the harpers in the king's court usually sang for the listening warriors. Instead of being about fighting and battle, or the hunting of wolves and bears, of stags and the aurochs, it was of healing the sick and helping the weak. He did not sing about war but about a loving Father in Heaven. showed greatness in the hour of death, by first remembering his mother, and then by forgiving his enemies. Danes? What horrible words do we hear!" cried the men of war. " Let us kill this singer from the south." And they beat their swords on their metal shields. The Druids, or pagan priests, even more angry, applauded the action of the fighting men. But Fostedina rushed forward to protect the harper, and her long golden hair covered him." No!" said the king to his warriors. " This man is my guest. I invited him and he shall be safe here." Only three days before, a party of Christian Danes had been taken prisoners in the forest. wolves to be torn to pieces. That was the law. she went out secretly to the prison pen. She unbolted the door, and, in the name of their God and hers, she bade the prisoners return to their land. a lot of people who felt sorry for the bleeding maiden wearing the cruel crown. Years passed by and a great change came over land and people. The very scars on Fostedina's forehead softened the hearts of the people. 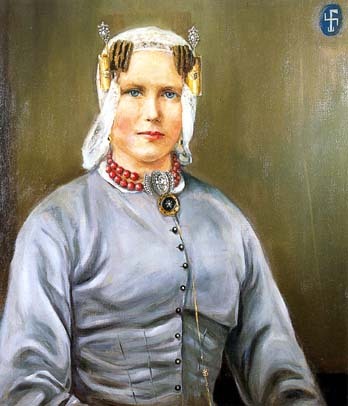 all, a Christian prince from the south, grandson of Charlemagne, fell in love with Fostedina, now queen of the country. It was a great day for Free Frisia. The wedding was to be in a new church, built on the very spot where Fostedina had stood, in pain and sorrow, when the crown of thorns was pressed upon her brow. concealed the scars of Fostedina. So Fostedina was married, with the golden helmet on her head. The bride came out of the church. Fostedina was a vision of beauty. Her head-covering looked so pretty, and the golden helmet was so becoming, that other maidens, also, when betrothed, wished to wear it. It became the fashion-for Christian brides, on their wedding days, to put on this glorified crown of thorns. to pass that the Frisian helmet, which is the glorified crown of thorns, is, in one form or another, worn even in our day. 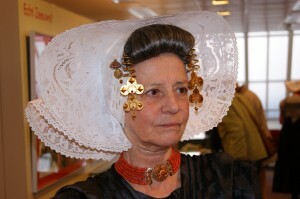 way or another, one can discern, in the headdresses or costumes of the Dutch and Flemish women, the relics of ancient history. 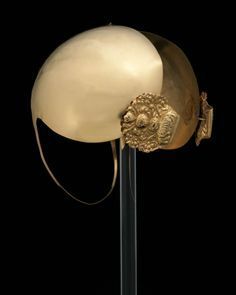 to Free Frisia, wears the ancient costume, with the golden helmet. Those who know the origin of the name Wilhelmina read in it the true meaning, which is, " The Sovereign Lady of the Golden Helm."